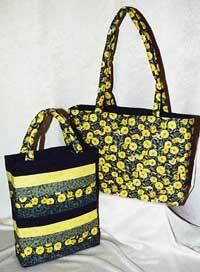 The Essential Tote Bag pattern has full instructions for creating a pleated look with layered fabric tubes. There are 2 sizes: THE DEEP BAG (multifabric bag on cover) 12" w x 15" h x 4" d and the WIDE BAG (Single fabric bag on cover) 18" w x 13" w x 4" d.
Choose a bag size and single or multi-fabric. Fabric is 42" wide and batting is 42" wide.